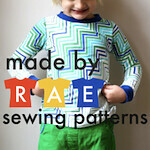 ah pattern testing, my favorite sewing blog activity! 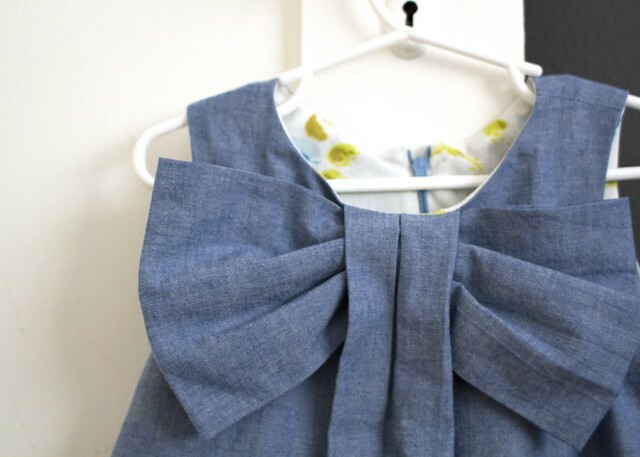 i first found the big bow dress on pinterest. it’s by miranda of one little minute. i feel like it had popped up in my feed over and over, and each time i saw it i was like “ooooh that’s so cute, is there a pattern?” i’d click through to her blog post and was always bummed to see there wasn’t a pattern, she just took custom orders for them. since i sew, i don’t buy dresses for Em anymore, so that didn’t really help me. i wanted to MAKE one!! but then i started following miranda on instagram and saw a photo one night showing she was working on a pattern! yippee! i told her i was excited, and a little while later she asked me to test it for her! 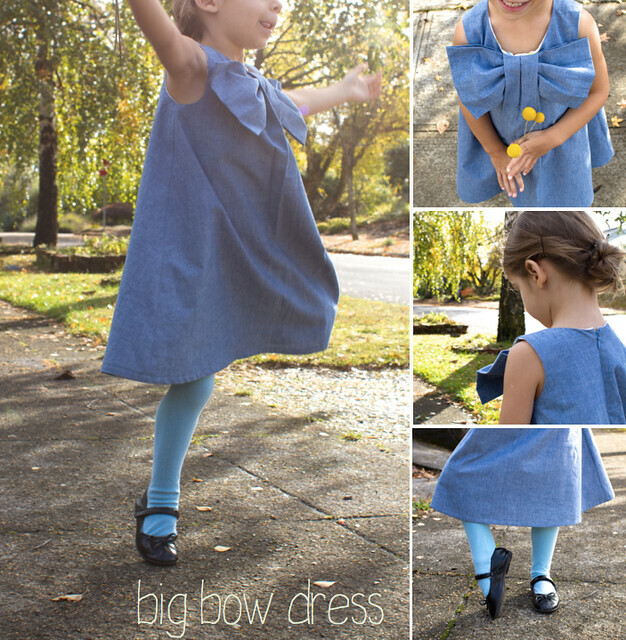 the big bow dress pattern is now for sale! for testing purposes, i sewed mine in a lovely chambray (purchased here) with vintage sheet lining. i love the casual vibe it lends to this more formal dress, and the blue floral sheet inside is so soft! i made a 3T in 4T length, and i just love how it looks on Em. Em is kind of a sucker for exaggerated details, i think, so she loves the bow and the roomy a-line fit for dancing too. even despite the blue color, she was sold on it pretty quickly! miranda was great at listening to tester feedback and as a result i think the pattern is really user friendly, though probably advanced beginner/intermediate-level since it involves a buttonhole, zipper, pleating, and lining…though the pattern is good at explaining it all too. i have just one construction tip that didn’t make it into the final version of the pattern that may help, and that is this: after sewing the buttonhole, sew a basting stitch down the length of the dress, continuing the same distance out from the fold as the buttonhole on the right side of the dress. press open the front box pleat and then remove the basting stitches. this will help you keep an even box pleat down the length of the dress. the dress closes with an invisible zipper, and her technique involves no hand stitching of the lining! yay! Em wore this to a wedding rehearsal and dinner (she was the flower girl! much more to come on that) and it’s great as a formal-ish but still so comfortable dress. 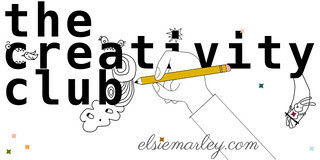 perfect heading into the holiday season, don’t you think? 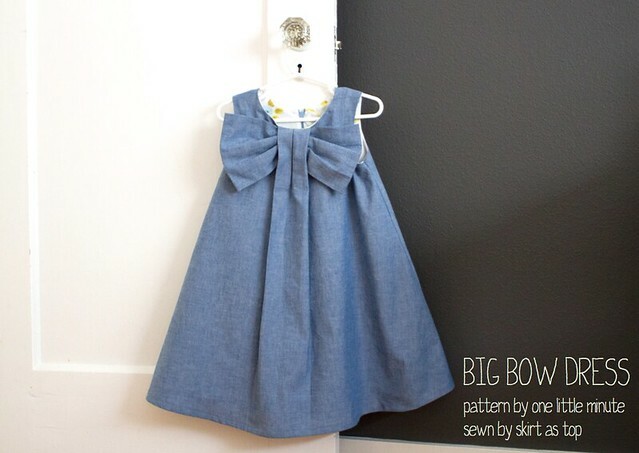 you can get your own big bow dress pattern right here! it goes from 6 months to size 6 and i think it’d be especially adorably ridiculous on a little baby. thanks for letting me test this pattern, miranda!! 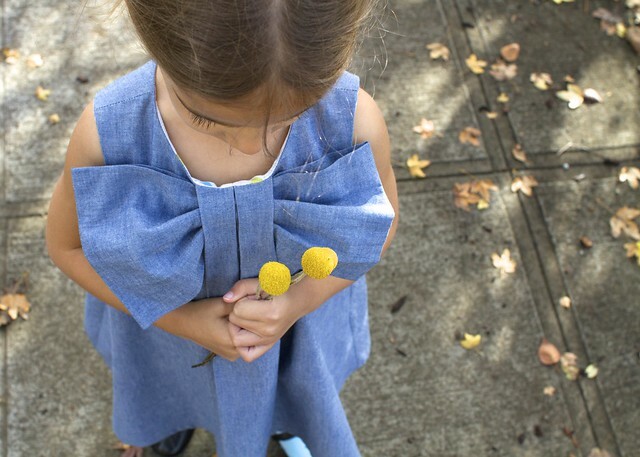 This is super cute- love that you used a vintage sheet for the lining…. off to check out Miranda’s site! Oh it’s so cute! That lining is the perfect detail. What a fun dress! So gorgeous! Great photo’s too. I also found that dress via Pinterest, and put it immediately on my to-do list. 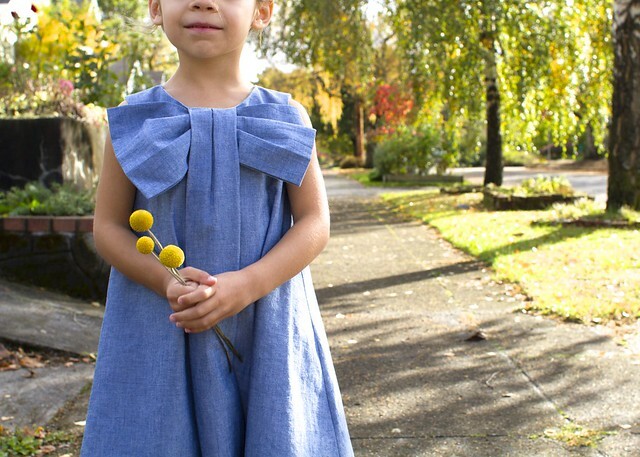 Kristin – this dress came out adorable!!! I love your photos too, the yellow felt balls are they? Just so stinking cute! The dress looks fantastic! I’ve had this dress pinned for a long time too. So happy to see a pattern for it now. I love your chambray version. So, so cute! I love that you chose a more understated fabric to balance the exaggerated details. You did a fantastic job! Pure loveliness! And you sold Em on BLUE??!!?!! 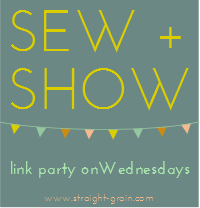 That’s when you know your sewing is fantastic! I love the vintage sheet lining detail. Yep, I think I’m going to have to get on the big bow bandwagon! Oh that is SO cute! Love that dress. And Em looks adorable. 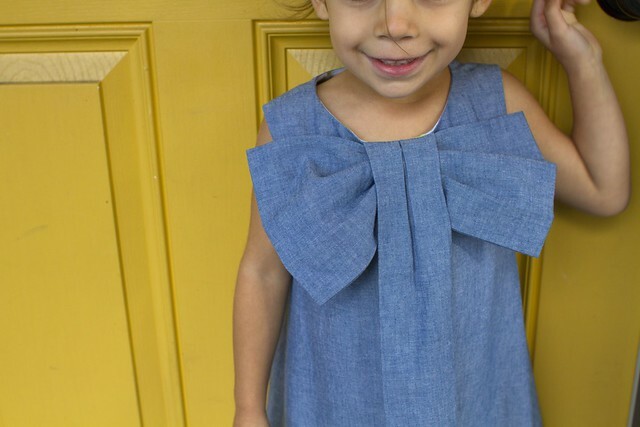 It’s super cute k, love it in the chambray. Pretty dress and gorgeous pictures! I love the lining and really want to learn how to add a zipper with a lining. 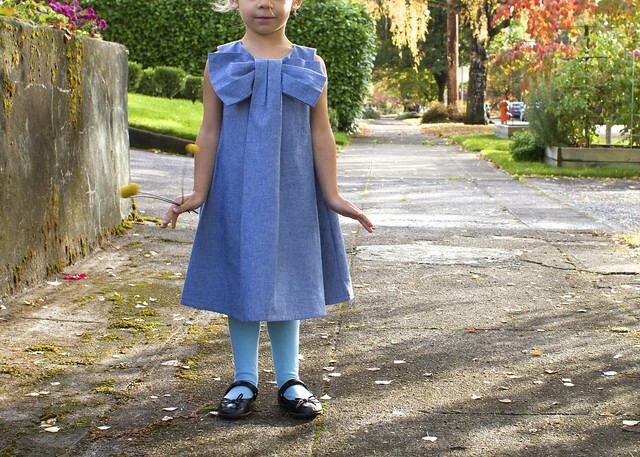 I just bought Melly Sews’ big bow dress pattern but haven’t sewn it yet. What a sweet little girl and dress… Love it! such a lovely fabric combo! it’s really darling on her. so cute and nice work! 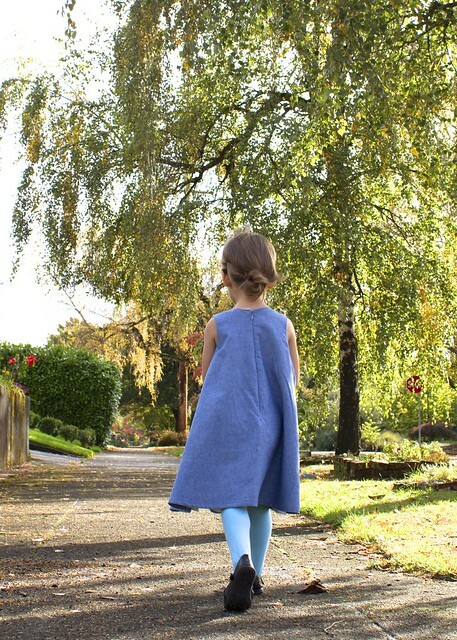 Love the blue tights with the chambray! That’s great she even went for the blue dress! Can’t wait to see the official flower girl one! Such a cute dress! I love the chambray and the vintage sheet lining. 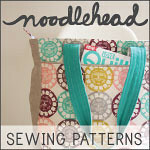 This pattern may have to go on my wish list! SUCH an adorable dress! 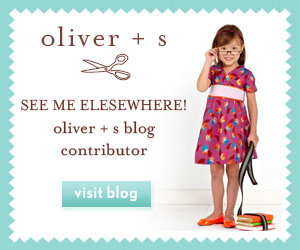 I would have loved that when I was little 😉 Your blog is absolutely adorable! Beautiful! I love this, Kristin! It is so stylish and perfect. 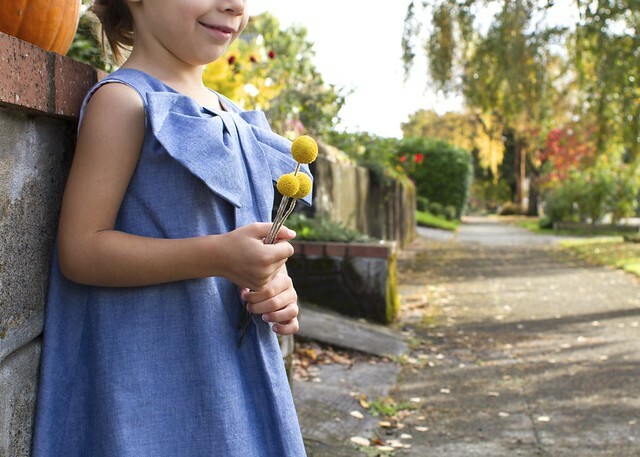 What an adorable dress and photo shoot!! What an interesting pattern. It reminds me of something out of Pattern Magic. Just adorable! I know the pictures you are talking about. They were part of my inspiration for making my daughter’s Country Cowgirl Christmas dress! I love the big bow, but it’s not for everyone.